Point Pleasant sophomore Peyton Jordan dives for a dig attempt during Game 1 of Thursday night’s non-conference volleyball match against Winfield in Point Pleasant, W.Va.
Point Pleasant senior Gracie Cottrill hits a spike attempt over a Winfield defender during Game 2 of Thursday night’s non-conference volleyball match in Point Pleasant, W.Va.
POINT PLEASANT, W.Va. — When things appeared at their best, they took a drastic turn for the worst. 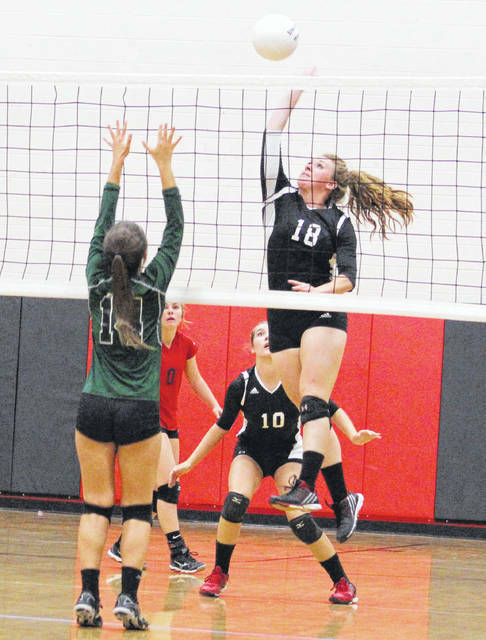 The Point Pleasant volleyball team held a 1-0 match lead and a game-point serve in Game 2, but visiting Winfield turned momentum in its favor Thursday night and picked up a 21-25, 26-24, 25-19, 25-11 decision in a non-conference contest in Mason County. The Lady Knights (9-2) battled through seven ties and eight lead changes in the opening game alone, but the hosts broke away from a 20-all tie by scoring five of the final six points en route to a four-point win and a 1-0 match advantage. Game 2 ended up being a mirror image of the first set as both squads battled through another seven ties and eight lead changes, with PPHS holding serve with a 24-23 edge. The hosts, however, followed up with a service error into the net that tied the game at 24-all, then the Lady Generals (22-1-1) tacked on the final two points to escape with a 26-24 win and a match tied at one. The Lady Knights continued to struggle from there after five of their first seven service attempts either went into the net or out of bounds, allowing WHS to grab an early 12-6 lead in Game 3. The Red and Black closed to within 12-9, but the guests reeled off 11 of the next 16 points to secure their largest lead of the game at 23-14. 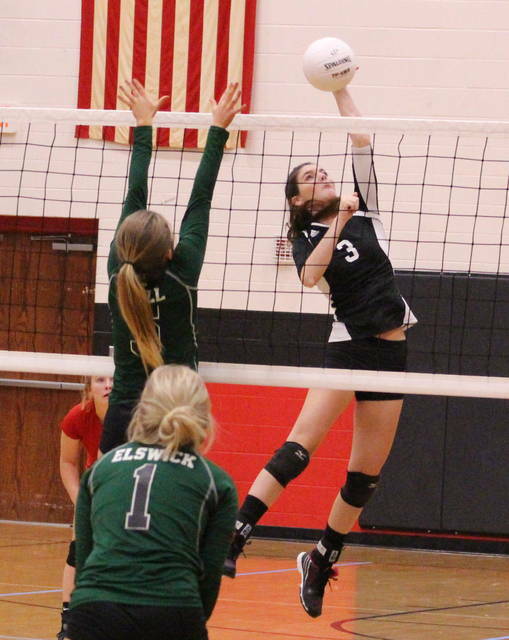 WHS never trailed in Game 3 and eventually took a 2-1 match cushion with the six-point decision. Point led only 1-0 in the finale as the Green and White broke away from a five-all tie by scoring five of the next seven points for a 10-7 lead, then reeled off 10 consecutive points for a sizable 20-7 advantage. The Lady Knights were never closer than dozen points the rest of the way and ultimately dropped the match with a 14-point setback in Game 4. 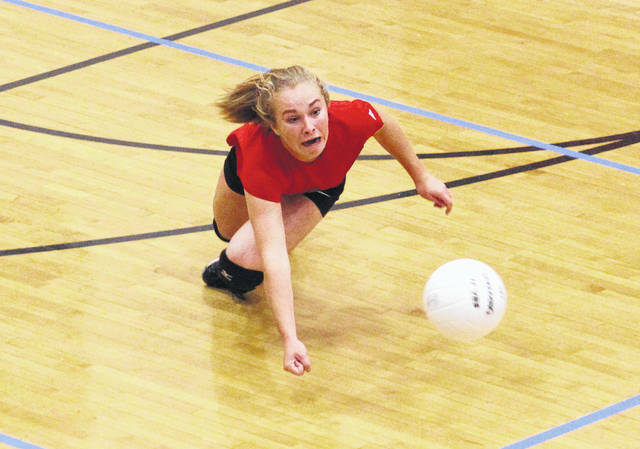 Point Pleasant — which had a five-match winning streak snapped — suffered its only other loss this season at Winfield back on Sept. 14. The Lady Generals have also won their last 14 consecutive matches. The Lady Knights started the evening well, producing 18 of their 28 kills in the first two games of the match. Momentum, however, swung in favor of Winfield after the way Game 2 ended — and the hosts never recovered. 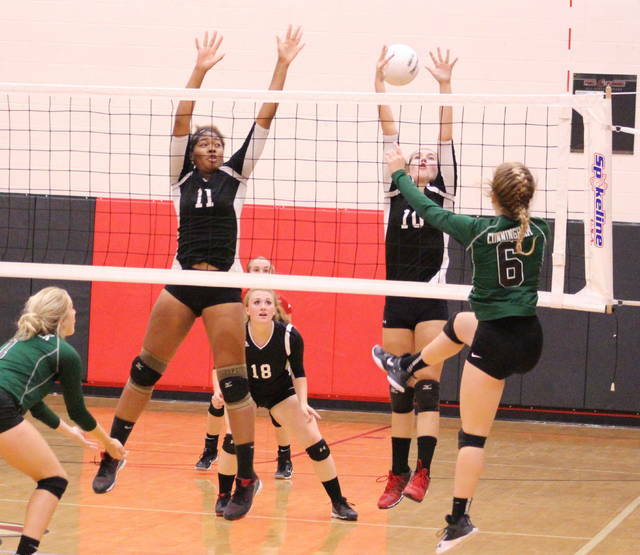 It was a tough result for PPHS coach Marla Cottrill to deal with afterward, primarily because her team showed it was more than capable of competing with Winfield. Or at least that was the case early on. Madison Hatfield led the Point Pleasant service attack with 12 points, followed by Brenna Dotson with eight points and Gracie Cottrill with six points. Olivia Dotson was next with five points, while Mackenzie Freeman concluded the scoring with three points. Lanea Cochran led the hosts with 12 kills and four blocks, followed by Tristan Wilson with six kills and three blocks. Brenna Dotson also had three kills and two blocks in the setback. Olivia Dotson added four kills and block, Cottrill chipped in two kills, and Hatfield also had a kill and a block. Autumn Elswick paced Winfield with 18 service points, followed by Esten Clay with 11 points and Taylor Ritz with 10 points. Kylie Williams contributed eight points to the winning cause, while Emily Reed and Kendall Hill wrapped things up with respective efforts of three and two points. With the postseason a little over three weeks away, the Lady Knights will begin their rebound efforts on Monday when they host Cross Lanes Christian before heading to Warren Local on Tuesday and then going to Buffalo for a tri-match Saturday. Cottrill believes next week will be a very important stretch for her troops, so she is hoping that they will come back hungry and ready to compete on a nightly basis. Monday’s game with CLCS starts at 6 p.m.